Along a lazy stretch of the Kings River, just off Adams Avenue in Parlier, an unlikely tourist destination is developing. Overnight visitors have been arriving from across the globe to see this incredible place, The Cat House on the Kings. In 1992, after a messy divorce, Lynea Lattanzio moved into a lovely, secluded, 4200-square-foot home on six acres with a spectacular view of the river. Her intention was simply to get away from it all and have as little interaction as possible with the rest of the world. That would change when her father, Pete Minneti, asked her to find him two Manx kittens. While searching the local animal shelters, Lynea could not resist picking up a litter of kittens that needed bottle-feeding. After visiting several veterinarians and spending $500 in the process, Lynea found homes for all of them. By the end of the year, she had rescued and found homes for 96 cats. This was the humble beginning of The Cat House on the Kings; the largest no-kill, no-cage, sanctuary, rescue and adoption center this side of the Rockies. It sits along the serene banks of the Kings River and is currently home to more than 700 adult cats and 100 kittens rescued from local shelters. Many of these animals are unadoptable and will live out their lives there, while scores more are hoping to find forever homes. All are able to roam freely and reside in comfortable houses and yards, including the spacious main house, which has been converted to an extraordinarily roomy cat habitat. The Cat House on the Kings gets no government funding and started with Lynea paying all the expenses. As generous people heard about this amazing place, donations started coming in but month-to-month expenses often exceeded income. 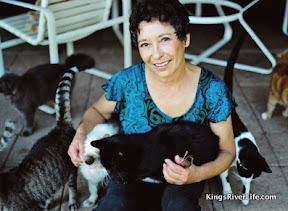 Lynea’s positive attitude (if you wish it, it will come) was rewarded with unexpected, exciting and life-changing news: Doreen Wallet, a name unfamiliar to Lynea and the staff, had left the largest part of her estate to The Cat House on the Kings. This lovely lady who had never visited The Cat House nor had any contact with Lynea, left her Redondo Beach condominium, a late model Honda Accord and two signed Norman Rockwell prints to The Cat House on the Kings. At about the same time, the six acres abutting The Cat House went into foreclosure and Doreen’s gift allowed Lynea to double the size of the grounds to 12 acres. It is still a mystery as to her connection with The Cat House but Doreen will always be remembered, as there is a monument out front in her honor. The circulation of this video was the turning point for The Cat House on the Kings as the resulting donations enabled The Cat House to run in the black for the first time. It was no longer dependent on a line of credit to cover monthly expenses for food, veterinary care, cat litter, cleaning products and the staff necessary to take care of such a large brood of rescued animals. 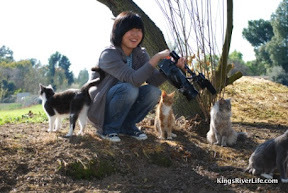 Korean filmmaker at The Cat House for a reality show on animals. Two years and over 820,000 YouTube hits later, The Cat House on the Kings has been attracting international attention. A Korean television station sent three filmmakers to record the daily activities of The Cat House over the course of three days. Another filmmaker, Jim Casey, spent a few days filming a pilot for a possible Animal Planet or National Geographic reality show. Cat Fancy, with an approximate audience of 239,000 readers, featured The Cat House in its February 2010 issue. This past May, Animal Planet spent over 10 hours filming The Cat House on the Kings with host John Fulton for an episode of their new fall series Must Love Cats that should air sometime next January. John Fulton, host of the new fall series Must Love Cats on Animal Planet, interviewing Lynea on the river bank. The attention Jack Perez’ video has garnered resulted in enough donations to purchase a new 2,000 square foot Kitten Quarters as well as a new 3-bedroom Senior House (already at capacity and needing to be enlarged) with patio and enclosed yard, separated from the general population so that the older cats are not bothered by boisterous young cats and puppies. Lynea leads the “River Walk” tour, accompanied by a large number of the residents. People from all over the world have come to experience what has been called “Cat Heaven” and “Doggie Disneyland” and many say the highlight of their visit is the River Walk. Lynea calls to the animals and a large number of cats and dogs come pouring out of the main house to follow Lynea and the visitors on a walk to the Kings River. Maureen Berwing camping out on The Cat House driveway. Lynea’s passion for the well-being of defenseless animals extends far beyond felines and has resulted in her saving the lives of over 18,000 cats, 6,000 dogs, and facilitated over 60,000 spays and neuters. The current menagerie includes close to 30 dogs and puppies, 6 rescued goats and a smattering of peacocks. The Cat House on the Kings continues daily sojourns to local shelters to choose which kittens are highly adoptable and which will be left behind with no hope of survival, a heartbreaking task for Lynea and her staff. “Fresno is number three in the nation as to the number of euthanasias it performs,” says Janice Rozzano, the president of Not so Purrrfect Angels, in a recent email. Lynea has long-term plans to remedy that situation, by raising enough money to open free spay and neuter facilities (including mobile units) throughout the Central Valley. As money permits, low cost veterinary care and adoption centers would be added to the spay/neuter facilities. Please visit The Cat House on the Kings and forward the link to Jack Perez’ video to all the animal lovers on your email lists. Together we can end the senseless slaughter of these innocent animals. The Cat House on the Kings is located at 7120 South Kings River Road in Parlier, California 93648 and is open to visitors by appointment only: 559-638-8696. Pete’s Sport Shop in Madera, which offers a host of services in addition to sporting goods. 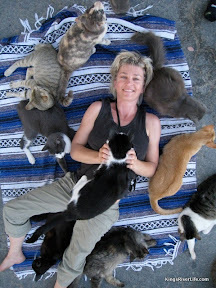 God bless Lynea for her continued work in rescue and rehoming 1000s of cats (and dogs). If you have never visited the Cat House, you need to do so. It is a wonderful facility and you have every kind of cat imaginable just begging for attention. Sigh. It is true bliss. .-= A recent submission from Diana: Julie & Julia: A Classic Hollywood Recipe =-. this was a wonderful suprise to me. I did not know that a former classmate from madera was doing such a spectaculare job in caring for animals, especially cats. I too am a cat lover and would have a hose full (thirty or more) if my husband would allow. Great job. I will be contacting the Cat House to make my helping contribution very soon. Love ya Lynea. Mike Rasmussen says Hi. 1000 cats, that’s quite amazing & Lynea Lattanzio definitely looks much younger than her age: that’s amazing too! May she live long to continue her NOBLE venture is my ardent wish!